What's your deal? Skate, create, build, destroy. Where are you doing it? Minneapolis and London when I can get back over there. How high can you ollie? Lower and lower each year. Can I have your board? Negative. Need it to remain sane. What's in your car? Bungee cords, Ipod, sleeping bag, duct tape, tools, skateboard, spare skateboard, spare car battery (current one is on its last legs), fireworks, Coors. It's a hot day, should we go skating or swimming? Skate, then ride bike to swim in Minneapolis’ lakes. Who's your favorite local skater? Too many in Minneapolis, lets just say Shier from over the pond. Mini-ramp and beer or out on the streets all day? Ummmm, ramp + bottle of red wine. How old are you in skate years? 17 years, with too many of those years lost due to debauchery. Ankles are feeling about 50 recently. It's 10 PM on a Saturday night, what are you doing? Probably just got a cold one, about to jump on the cruiser or my bike to find the next one. Dude, no comments on Luke!? HARSH---While he might be the only English guy you know he's without a doubt the best. Cheers Mate! Thanks for you bein you luke! If it weren't for you there wouldn't be backyard ramp jam... Every year I look forward to that event. It's the most fun I have skating all year. Thanks for organizing that all these years... You rip. 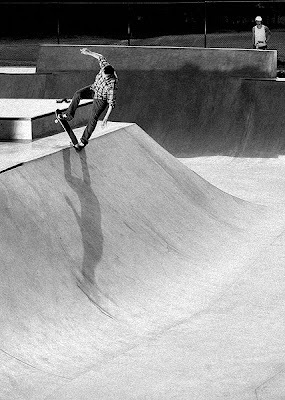 Thanks for getting us out of the skateparks, and keeping the private ramp scene alive ! Lead us to the Halfpipe! I love me some red coat! yeah!